You spend a vast majority of your life in bed sleeping, so it’s only right that you make the correct buying decision when It comes time to replace your current mattress. It can be challenging to know which mattress suits you best, especially with the emergence of new mattress brands which has made the process harder because of the increase in choice available. One of these newer mattress brands is Tweak who are an online mattress retailer who is aiming to revolutionise the way that we currently buy mattresses. Gone are the traditional showrooms and sales staff that we’re used to, and welcome to the new streamlined process. We’ve created this Tweak Slumber mattress review so you can see if this mattress is the right fit for you to take your sleeping experience to the next level. Tweak is a UK based business that has over 30 years experience in the furniture industry and has felt first hand the drawbacks of a poorly constructed mattress which led to some severe sleep disorders. They highlighted the need for a new type of mattress as the current market only catered to the same group of people and there wasn’t much difference from one mattress to the next. 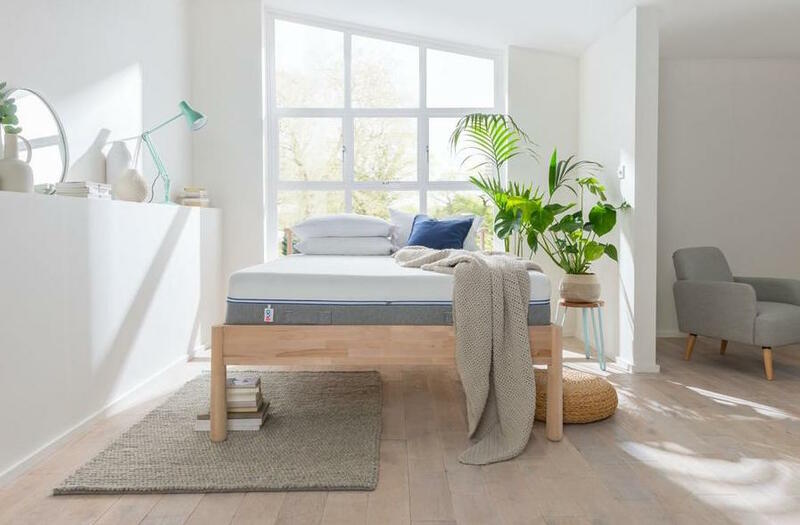 They are collectively trying to push sleep quality up the list of consumers priorities and are on a mission to deliver higher quality sleeping experiences starting with their flagship mattresses. Tweak Slumber have found a common problem and created a mattress that solves it. Choosing a mattress for two people who share a bed can be difficult especially if each person has different individual needs. So, in stepped Tweak Slumber who have created a customisable mattress where each half can be changed in firmness between soft, medium or firm. Traditionally a compromise would need to be made by couples, but both deserve to have the level of comfort and support that they need to ensure that they experience the most restful sleep. The Tweak mattress itself has three individual layers that work together to provide a high quality sleep surface. The three layers include Viscoool foam, individually wrapped pocketed spring coils and reflex foam. The mattress has a hypo-allergenic plush fabric cover which is breathable allowing for air flow. It's also fire resistant while also being ideal for users who suffer from dust or allergies. The cover is fully removable and can be machine washed at 30 degrees to keep your sleeping surface fresh and clean for longer. The first mattress layer is 4cm thick of Viscoool foam which contours to the shape of your body providing a hugging effect which relieves pressure from the critical parts of your body such as your neck and spine. The open cell structure also wicks away heat and regulates your temperature throughout your sleep, so you don’t experience night sweats. The middle layer uses reflex foam which is slightly different from traditional memory foam and bounces back quicker which means that you can move around the bed easily using less energy. Reflex foam also doesn’t get as warm as traditional memory foam, so this will keep you cooler at night. This layer is fully customizable allowing you to choose your firmness level for both you and your sleeping partner’s needs. You can choose between either soft, medium or firm. The firmness you choose is down to personal preference, and if within the first 100 nights you need to try a different firmness density then Tweak will send you it free of charge. The final layer features up to 2,000 individual pocket springs, with each coil providing support. Because each spring moves independently, this limits the amount of motion transfer so your partner will not be disturbed by any movement that you make. The pocket springs are built into a support base which is then covered in high-density reflex foam so you can feel the bounce when you’re on the mattress. 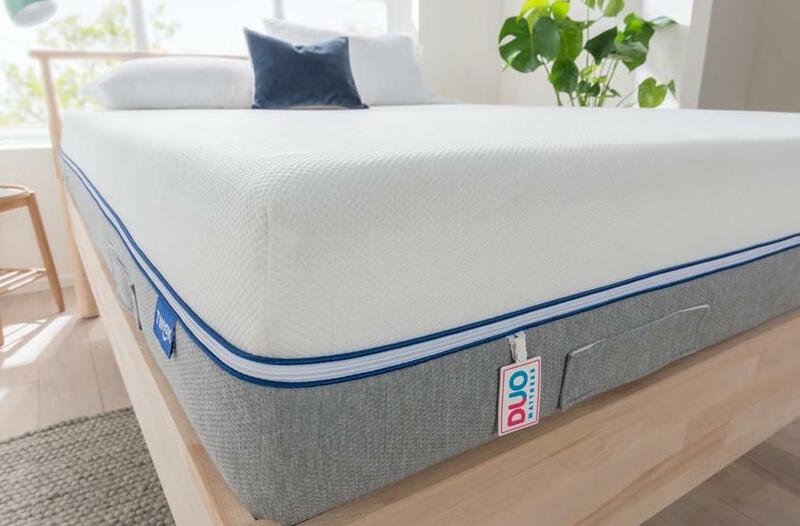 The DUO mattress has been thoroughly tested with roller testing to ensure that it is made to last with it performing exceptionally well in terms of foam dipping and sagging. In terms of sizing the DUO is available in Double, King or Super King sizes. As you know by now, the main feature of the Tweak mattress is the fact that you can interchange the firmness levels to suit your needs and you don’t need to agree on a firmness level with your partner which is great for the both of you. There are three different firmness levels and as you’d expect the difference between the three is noticeable to ensure that they can cater to everyone’s needs. The firmness is highly responsive as well as being supportive of your body position that you’re sleeping in. With the mattress cover, you can feel your body staying cool due to the increased airflow of the mattress working to regulate your core body temperature. Soft – This firmness is the softest and provides a cloudy like cushioned feel while contouring to the shape of your body. This is ideal for side sleepers who still want to feel consistent support while they sleep. Medium – This is the most popular option and is ideal for front or back sleepers. This will give you the firmness to support your body as well as the contouring and hugging feeling to relieve the tension from your body. Firm – This is great for spine alignment as it provides the highest level of support throughout your sleep. This is ideal if you regularly suffer from aches and pains which will leave you feeling refreshed in the morning. It’s natural to think that with removable inserts that the mattress won’t be stable when you’re sleeping on it, but this couldn’t be further from the truth as the mattress remained solid and secure even when each half has different firmness inserts. Off-gassing is common with memory foam mattresses due to the chemicals that are used to manufacture the foam materials which leads to an odour being created. This means that when you first buy the mattress, this odour can be released which often isn’t pleasant. With the Tweak mattress, there is a degree of, but it’s barely noticeable. It’s not unbearable, but it can affect your ability to get a good nights sleep, but luckily this won’t linger much longer than a few hours. To speed up the process, you can open a window to allow to the odour to dissipate quicker. Ordering the mattress is as simple as a few clicks on their website, you need to select your desired firmness and enter your payment details and then you’ll receive your order confirmation receipt via email. Tweak have a delivery service which is matched by very few competitors and is great for consumers who often have a busy schedule. Every mattress is delivered using a two-person team so you will not be left to haul it from your doorstep up the stairs to your desired room, and then having to dispose of your old mattress. Tweak will take care of all of this by taking the mattress to your desired room and remove all the packaging. For a small charge, they can even take your old mattress away, but this must be selected at the checkout stage; otherwise, they will not be able to remove it. Once you place your order, their delivery partners will give you a range of delivery dates to choose from to fit into your schedule. If none of these dates is suitable, you can contact the courier directly to organise a more convenient date. Delivery is stated at being 10 to 15 working days which is relatively long in today's world, but this is because the mattresses are made to order. The mattress firmness is fully customisable means that you can tailor it to your individual needs even if you share a bed with another person and you can both have different firmness levels. It ensures that you can both experience a high-quality sleep without compromise. Included in each mattress purchase is a 100-night trial. This allows you to have a proper test of the mattress to make sure that it’s right for you, while also giving you time to request any firmness changes if you require. This trial period shows that the manufacturer believes in the quality and has shown in the minimal returns that they process indicating that the vast majority of customers are happy with the product. If you’ve ever been mattress shopping in showrooms, then you’ll know that lying on a mattress for less than five minutes will give you no indication about how it will feel after a full 8-hour sleep or even years after you purchase it. So this 100-night trial gives you more than enough time to make a final decision. These mattresses are built to last which is why all DUO mattresses are provided with a 10-year manufacturer’s warranty. This protects you from any physical defect that develops with the product and shows that the mattress has been built to last. Not only is delivery free but it is delivered by two people who will then place it in your desired room. Although the mattresses are delivered in a compact box, they can still be very heavy, so this is a strong positive which isn’t offered by many other online mattress retailers who will often deliver it to your door only. All Duo mattresses are manufactured in the UK by one of the leading bed manufacturers Breasley. They are approved by the National Bed Federation and have been one of the leaders in producing quality mattresses for over 40 years utilising their high-quality machinery and engineers, so you can be confident in the overall quality while also supporting a truly homegrown business. The mattress is 100% latex free which is ideal if you suffer from latex allergies. This also works well with the hypoallergenic mattress cover which supports users who suffer from frequent allergic reactions to dust. Because each side of the DUO works independently, they have their own set of individually wrapped pocket springs which reduces the level of roll disturbance. 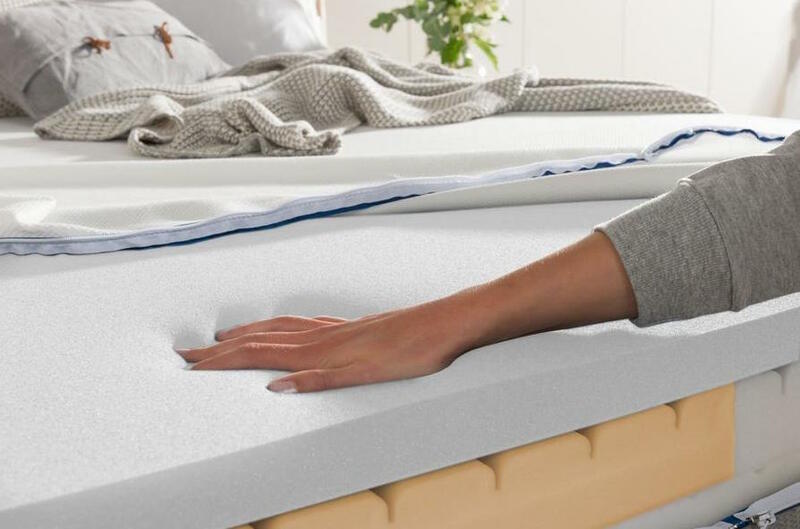 The added benefit of the foam layers also further decreases the level of motion transfer experienced with the mattress. If you want the mattress immediately but don’t quite have the full amount of money, Tweak offer a 0% finance option which allows you to pay for the mattress in instalments. As you’d expect this is subject to a credit check, but this is an invaluable option for those that are in desperate need of a new mattress and an improved sleep. Standard delivery can take 10-15 working days which can be quite a wait, but it’s likely that you’ve been sleeping on your current mattress for up to 10 years so waiting a couple more weeks isn’t the end of the world, but it’s something to bear in mind. 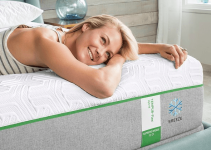 With the rise in online mattress companies, it's refreshing to see a new company come with a new USP angle targeting couples and the product does work well. So, if you’re a couple, it would be very worthwhile to trial this product especially due to the firmness customisability as well as the inner pocket springs which limits the level of motion transfer leading to an interruption-free sleep. This is a lovely British manufactured product and is built to last and is backed by the 100 night trial period and 10-year warranty, coupled with first class customer service in the rare chance you do encounter any issues or problems.